Smartwatches are not the latest developments in the wearable technology market, but this does not mean that there is no room for new advances. On the contrary, Apple has come up with a new generation smartwatch that they have called the Apple Watch Series 2. 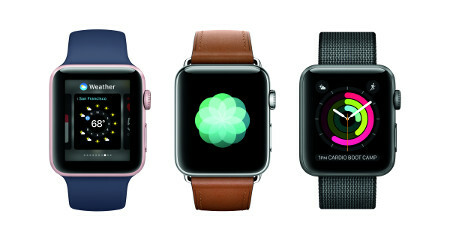 Touted to be the “ultimate device for a healthy life”, the Apple Watch Series 2 will boast of water resistance of up to 50 meters, in addition to GPS support, a display that is twice as bright compared to its predecessor, a dual-core processor that should let you get up and running in double quick time, as well as the watchOS 3. The Apple Watch Series 2 is packed with incredible fitness and health capabilities. Thanks to the integrated GPS support, there is now no need for you to run with your iPhone. Being rated as water resistant to 50 meters, it is ideal when it comes to swimming, surfing or simply to frolic in the pool. Swimmers will be pleased to know that Apple has come up with all-new algorithms after hundreds of hours of research for two new workout options, pool and open water. The Apple Watch Series 2 is smart enough to count laps, track average lap pace and auto-detect stroke type in order to accurately measure active calorie burn. The integrated GPS lets you record precise distance, pace and speed for outdoor workouts such as walking, running or cycling. Users are able to kick off an outdoor workout immediately as Apple Watch Series 2 relies on Wi-Fi, GPS and locally stored satellite data to quickly identify one’s location. Upon the completion of an outdoor workout, you can check out your route map which will depict variations in speed in the Activity app on iPhone. The Apple Watch Series 2 will arrive in two different case sizes, 38 mm and 42 mm. Expect the Apple Watch Series 2 to come in gold, rose gold, silver or space gray aluminum, or silver or space black stainless steel cases, with prices starting from $369 all the way to $1149 for the Apple Watch Hermès.